Does a sudden loud imaginary sound of a cracker burst or a falling drum wake you up with a jerk? That's when you have got the exploding head syndrome. This usually happens before or after a deep sleep and may be accompanied by a rapid heart rate, shortness of breath, some sweating, fear, and anxiety. People can encounter this once in a while or very often. It makes the individual experiencing it feel extremely stressed and fatigued. The exact cause of this syndrome remains a mystery, but some possible causes identified are seizures in the temporal lobe of the brain, or shifts in the components of the middle region of the ear occurring suddenly. 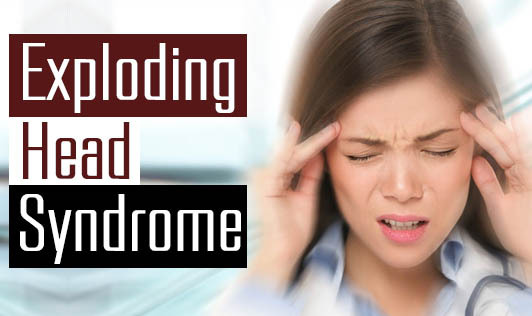 However, the exploding head syndrome does not pose or indicate any health risks as such. If it occurs frequently, a doctor can be consulted and he/she may wish to obtain the patient's medical history to reconfirm. Antidepressant drugs, yoga, listening to soothing music, bathing with warm water before hitting the bed may be prescribed to help create a more relaxing environment and reduce stress/depression caused to the patient. In some cases, it could be a result of consuming certain drugs or even due to a prolonged disturbing situation experienced by the person at the personal level. The syndrome is not so well known yet and further research is required to understand it better. If you experience similar symptoms, consult your doctor/counselor to seek advise.